*Department of Management, Islamic Azad University, Arak Branch, Ira. E-mail: h-javanmard@iau.ac.ir. **Corresponding Author, Instructor of Entekhab University, Iran. E-mail: iranmanesh@icgco.org. ***Graduated of Business Administration, Islamic Azad University, Arak Branch, Ira. E-mail: bakhtiari_s2005@yahoo.com. Received June 08, 2014. Review November 16, 2014. Accepted December 15, 2014. Purpose - This study aims to examine new product adoption (NPA) in the context of clothing in Iran. Research design, data, and methodology – Data were gathered from cloth owners in Iran, focusing on famous cloth brands cloth. Further, using the proportionate stratified sampling method, a total 438 usable questionnaires were returned and analyzed through the use of structural equation modeling (SEM). In addition, LISREL software was used to analyze the data collected through the structured questionnaires. 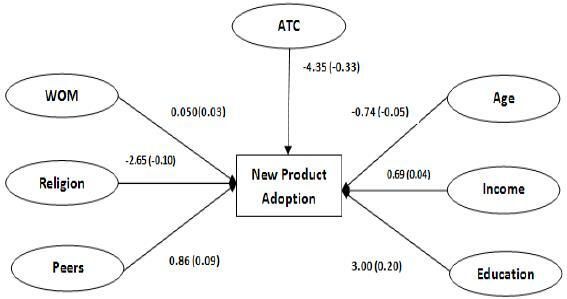 Results – Overall, the study findings indicate that education has a positive effect on new product adoption, whereas the impacts of religion and Attitude towards Consumption (ATC) on new product adoption are negative and significant, but the effect of age, peers, and income on new product adoption is not significant. Conclusions – Using date obtained from a large random sample of Iranian consumers, this study offers a deeper understanding of the attitudinal and personal antecedents of consumers’ new product adoption in an emerging market. Using the findings of the articles and conclusions will be useful for market researchers and, of course, business persons. Key Words : New Product Adoption (NPA), Attitude towards Consumption (ATC), Religion, Positive Word of Mouth, Peers, Demographic Characteristics. Commercialization is a challenging process, and having a sound technology or idea for a product that one people wants to market profitably does not guarantee market success (Rourke, 1999). Uncertainty in product adoption and frustrating market resistance can prove defeating to innovations that contain technological value and deserve rapid adoption (Booz and Hamilton, 1982; Griffin, 1997). Almost half of the new products introduced in the USA either are canceled or fail to meet targeted financial returns (Sivadas and Dwyer, 2000). With this reality, consumer evaluation of new products is important for both marketing theory and practice. Consumers’new product adoption (NPA) behavior is of fundamental interest to marketing managers and researchers alike because of its role in the new product diffusion processes (Rogers, 1995). New product adoption (NPA) by a consumer is affected by his perception of many factors. Being knowledgeable about the new product also influences consumers’decision to accept or reject such a product; consumers with less knowledge tend to avoid purchasing (Lai, 1991). The role of knowledge in the adoption of new products is vital. For example, research in agriculture shows that farmers having more information about a new technology tend to accept it much faster than those who are informed less. Understanding what differentiates visionary customers who adopt products earlier in the process from more pragmatic customers in the mainstream market has been suggested as the key to new product marketing in today’s high-tech era (Moore, 1999a, b). In this paper, we first develop hypotheses based on a review of the current literature on peers, religion, demographic characteristics, positive worth of mouth (PWOM), consumption attitudes, and new product diffusion and adoption. We then report an empirical study to test the hypotheses. Finally, we discuss theoretical and managerial implications. The theory of adoption and diffusion of new products by a social system has been extensively researched by Rogers since 1962 (Rogers, 2003). His research and commentary greatly influenced several modern models of diffusion. He identified five adopter categories that still hold today: Innovators, Early Adopters, Early Majority, Late Majority and Laggards (Rogers, 2003). His model was expanded by Bass (1969)to incorporate the timing of purchase. Initial purchases of the product are made by both "innovators" and "imitators," the important distinction between an innovator and an imitator being the buying influence. Innovators are not influenced in the timing of their initial purchase by the number of people who have already bought the product, while imitators are influenced by the number of previous buyers. Imitators "learn," in some sense, from those who have already bought (Bass, 1969). Finding early adopters accelerates the diffusion of innovation, minimizes the chance of new product failure (Im et al., 2003), and helps firms enhance the effectiveness of their new product marketing efforts such as segmentation, targeting, positioning, and the four Ps (Garber et al., 2004; Kumar and Krishnan, 2002). Consumers’ new product adoption (NPA) behavior is of fundamental interest to marketing managers and researchers alike because of its role in the new product diffusion processes (Rogers, 1995). Understanding what differentiates visionary customers who adopt products earlier in the process from more pragmatic customers in the mainstream market has been suggested as the key to new product marketing in today’s high-tech era (Moore, 1999a, 1999b). Extant literature broadly defines consumer innovativeness as the desire to seek out arousal and novelty from new products (Hirschman, 1980). Most innovativeness studies have leaned toward the exploration of commonality among early adopters that can produce equifinal adoption results (Gatignon and Robertson, 1991). Consumer innovativeness is also investigated as a precursor to the adoption of new products (Chau and Hui, 1998). Others have endeavored to identify innovativeness as a personality construct to identify new product adopters (e.g. Mowen et al, 1998). The general assumptions of global innovativeness are anchored in personality inventory that determines behavior, specifically the adoption of new products (Leavitt and Walton, 1975; Ostlund, 1972). It is the very nature of their innovativeness trait, rather than other intervening variables (e.g. situational effects, communicated experience of others), that engenders consumers to adopt new products (Midgley and Dowling, 1993). Adopting this perspective of innovativeness as a latent trait, several studies have identified multiple aspects of global innovativeness, including openness to information processing (Leavitt and Walton, 1975), willingness to change (Hurt et al., 1977), inherent novelty seeking (Hirschman, 1980; Manning et al., 1995), optimum stimulation level (Raju, 1980), and variety seeking (Lattin and McAlister, 1985;Menon and Kahn, 1995). All of these global innovativeness components together lead to the tendency to acquire novel information and/or adopt new products. In addition, actualized innovativeness has also been posited to include behavior that deals with the acquisition of information associated with new products (Hirschman, 1980). The acquisition of novel information may be achieved through sources such as product catalogs, reviews of new products, product trial etc. Following Hirschman’s (1980) suggestion, we disintegrate actualized innovativeness into the actual adoption of new products (ADOPT) and the acquisition of novel information associated with new products (AQNIP). The discrepancy in consumer innovativeness’ability to predict the adoption implies that consumer innovativeness perspective is nota sole theoretical explanation of new product adoption and that other intervening variables may confound this relationship (Midgley and Dowling, 1993). A resistance to innovation adoption perspective holds that novel attributes of new products embodying features (e.g. technological complexity, high price, newness) with unexpected side effects can create disruption in consumers’ established routine (e.g. Ram and Sheth, 1989; Sheth, 1981). This may conflict with prior beliefs of consumers and result in resistance to adoption (Folkes, 1988; Locander and Hermann, 1979). Word of mouth is oral communication between two or more persons concerning a brand, product or service on a non-commercial basis (Arndt, 1967). Silverman (1997) offers three reasons for the dominant power of information group influence on consumer behavior compared with other information sources: group influence is thought to give reliable trustworthy information, in contrast to the mass media, personal contacts offer social support, and the information provided is often backed by social pressure. Bayus (1985) noted that word of mouth is sometimes even more influential than other promotion methods and; so in many instances consumer often relyon word of mouth when making their actual purchasing decision (Ted, 1971; Bayus, 1985; Woodside & Delozier ,1976; Yeung & Yee, 2003). Therefore, information received from family members and friends is always used to reduce uncertainties. WOM has a strong influence on product and service perceptions, leading to changes in judgments, value ratings and the likelihood of purchase (Arndt, 1967; Fitzgerald Bone, 1995; Peterson, 1989). The important role WOM plays has been long recognized by diffusion of innovation researchers (e.g. Ryan and Gross, 1943), and has been acknowledged as the most important communication source between consumers (Derbaix and Vanhamme, 2003). At its core, WOM is a process of personal influence, in which interpersonal communications between a sender and a receiver can change the receiver’s behavior or attitudes (Merton, 1968). While the potential power of WOM as a form of promotion is generally accepted (e.g. Arndt, 1967; Buttle, 1998; Dye, 2000), it is important to understand that the generation of positive WOM is not sufficient for it to be an effective source of communication; the recipient also needs to react positively to the WOM. Merton’s (1968) definition supports this dual process conceptualization of WOM. However, the majority of WOM research in marketing has focused on its generation (e.g. Harrison-Walker, 2001; Brown et al., 2005). H1: Word of mouth has effect on new product adoption. The impact of religion on various human aspects has been investigated by many researchers in the social sciences (Bonne, 2007 Montgomery, 2002). Such literature shows the importance of religion in the social life of human beings. Religious commitment impacts consumers’ likes and dislikes (Rehman & Shabbir, 2010). From a business and marketing perspective, religious culture influences almost everything from the foods we eat and the way we prepare them to the size of our families; the styles we adopt and clothes we wear; our social and recreational activities; our personal grooming, hair styles and body decoration; and even our willingness to adopt new products. Religious commitment plays an important role in people’s lives through shaping their beliefs, knowledge, and attitudes. Different religious groups such as Muslims, Christians, Buddhists, and others with other religious orientations have differing beliefs. These beliefs cannot be avoided when a society is analyzed (Fam et al.,2002). These religious commitments and beliefs influence the feelings and attitude of people towards consumption (Jamal, 2003). Religious commitment affects consumers’orientations regarding consumption patterns, as well as their social behavior. Consumers are influenced by different factors when trying to decide on whether or not to acquire a new product. Although many of these factors have been thoroughly studied, religion, as an influential factor in consumers’lives, remains largely neglected in this particular area. To investigate the relationship between these two variables religiosity was treated as the independent variable while NPA was treated as the dependent variable, i.e. supposed to be influenced by religion. Generally, religion can be defined as a strong belief in a supernormal power that controls human destiny or an institution to express belief in a divine power (Rehman & Shabbir, 2010). Andrew (2005) discussed that religion’s influence in consumer research remains under-researched. He explored religiosity’s effect on culture and consumption by comparing Indians living in Britain, with Asian Indians and British Whites. His research is relevant to both academics and practitioners who wish to understand the role of religion’s influence regarding culturally determined consumer behaviors. His analysis indicated that Indians living in Britain and British Whites sample groups were culturally less group and consumption-oriented than Asian Indians. Declining levels of religiosity produced mixed results for Indians living in Britain, when compared to Asian Indians, indicating that: attendance at a religious institution is not akin to viewing religion as an important aspect of daily life, a diversity of religiosity determined consumer behaviors across the Indian sample groups, and religion is an acculturation agent (Ilyas et al., 2011). H2: Religion has effect on new product adoption. Adopting new products in general means embracing new ideas, changing present lifestyles, and taking and accepting risks. These are the qualities closely related to whether and to what degree a consumer is open to the changes introduced by market offerings. Although certain new products may help enhance the consumer’s feeling of achievement and power, the relevance of self-enhancement and self-transcendence may be more product category specific, and the value of hedonism may be only applicable to a limited number of product categories. H3: attitude towards consumption has effect on new product adoption. H4. Peers view has effect on new product adoption. H5. Age has effect on new product adoption. H6. Income has positive effect on new product adoption. H7. Education level has effect on new product adoption. 3. The sample contains students with different cultural background from various part of the country and it does not limited to a specific culture or city. Therefore, it is representative of citizens from all over the country. Mc Quitty (2004) suggested that it is important to determine the minimum sample size required in order to achieve a desired level of statistical power with a given model prior to data collection. Although there is little consensus on the recommended sample size for SEM (Sivo et al., 2006), Garver and Mentzer (1999), and Hoelter (1983) proposed a ‘critical sample size’of 200. Structural equation modeling (SEM) was used to assess the data because of its ability to estimate multiple interrelated dependent relationships. Additionally, SEM has the ability to represent unobserved relationships, correct for measurement error, and define a model based on the entire set of relationships. In other words, as a rule of thumb, any number above 200 is understood to provide sufficient statistical power for data analysis. As such, 438 M.S/M.A students and employers of Islamic Azad University of Iran (Branch of Arak) have been selected as the research sample. Anonymous questionnaire has been used for data collection and objective achievement. The questionnaire includes two parts. First part contains participants’ demographic information. The second part includes 26 questions in relation to the research main variables measured according to five-point scale. Reliability test was used to measure the internal consistency based on computed values of Cronbach alpha (α). It was found that all the variables met the cut of value 0.65, which was acceptable for retaining the variable (Leech et al., 2005). The reliability index equal is 0.745. With regard to the point that the minimum reliability index for research questionnaires is 0.65, so it is observed that the obtained α coefficient is appropriate coefficient and thus ensures the questionnaire reliability. There were seven constructs used in this study: New Product Adoption (NPA), Attitude towards Consumption (ATC), Religion, Positive Word of Mouth, Peers, Demographic Characteristics (age, income and education). The sample was split into 60 percent females and 40 percent males, providing a sample close to that of students of Islamic Azad University Iran (Branch of Arak). Demographic variable is indicated in table 1, 2 and 4. Our proposed relationships are significant for the relationship between religion and NPA (H2), ATC and NPA (H3), education and NPA (H7 and non-significant for relationship WOM and NPA (H1), peers and NPA (H4), age and NPA (H5), income and NPA (H6). education has a positive effect on NPA and effect of religion and ATC are negative, though education has stronger effect on NPA. Table 5 and Figure 1 show the results of the path analysis. The main objective of the research was to investigate the effect of religiosity, demographic variable, attitude toward consumption and peers among Iranian consumers on NPA. Needless to say, all the respondents were Muslims. The findings provide evidence that a relationship exists between these eight variables. Consumers’new product adoption (NPA) behavior is of fundamental interest to marketing managers and researchers alike because of its role in the new product diffusion processes (Rogers, 1995). A major stream of research has focused on the influence of personal characteristics such as demographics and social-psychographics on NPA behavior, which has important implications for the practices of market segmentation and targeting, as well as product positioning and marketing communication. Understanding the key determinants of NPA helps companies identify target markets, position their new products accurately, and design more effective communication strategies (Wang et al., 2006). The results of this study have important implications for both marketers and managers. Perhaps a lot of research has been done on oral propaganda (WOM) and peers, but the impact of these two variables on the acceptance of new commodities has been considered less. So, we tried to real with this subject in the research and develop the existing literature in this field. Results of the research on these two variables indicate that the oral propaganda and peers have no effects on the acceptance of new clothing. A reason of this subject can be the effect of religion and family on society of Iran that makes people more accurate in selecting new clothes since families are influential on the kind of clothing and attitude of individuals in choosing clothing while selected age classes in this research include people over 18 years old with collegiate education in which it is expected the effectiveness of these age groups about the selection of new clothes of their peers is less than age groups under 18 years old. Of course, another reason of it can be the kind of a product and the amount of commodity involvement: that is perhaps if people face the acceptance of a commodity with high involvement, they will use more peers’ opinion and show more attention to the oral propaganda (WOM). Since evidence shows religiosity among Iranian consumers affects their attitude towards the adoption of new products but this effect is negative. Decision makers need to consider those when introducing new products to Muslim markets. Decision makers need to study their markets carefully if they are to establish a strong presence in these markets. If consumers in these markets are more religious, then the new products and the way these products are promoted need to be prepared in accordance with the spiritual and religious dictations and influences that those consumers acknowledge (Rahman, Shabir, 2010). We discover that attitudes toward consumption have significant effects on NPA. Consumers’ adoption of market innovations is associated negatively with their attitude toward existing products (unwillingness to replace old, still functional products with new products) (Wang et al.,2006). As hypothesized, the adoption of new product was found to be influenced by demographic variables. Inconsistent our results show that consumers’ NPA was not related to age and income. However, it has a positive effect on education. A society studied is the religious one in Iran where Muslims include its majority and it is possible that in other religions, other reasons with different impacts be effective in selecting or accepting new clothing. Hence, next researchers deserve to do research in this field and compare the results. In this research only the new clothing adoption was considered where as the other purchase behaviors or any other product with different involvement can be taken in consideration. The reason for choosing this purchase behavior was the link to the university students and employees as they were between the age group of 18 and more in this age group the common thing between them was the clothing purchase, which they do of their own choice. So it was considered as the best purchase behavior amongst the university students and it can be said as the limitation of the research as well. The research is limited to the university students and it can be empirically tested by taking public and with a better sample size. A limitation of this study is that all respondents were university students with limited disposable income. Therefore, it is anticipated that the strength of their beliefs leans towards idealism, which is also a characteristic of student populations. It is important to note that the consumption patterns and believes of consumers tend to change with the increase in their income. And the last point is that clothing is a product with low involvement and the research results may be different for products with high involvement and services. It is recommended for future researchers to use the proposed model for products with the third point is that cloth phone is a product with high involvement and the research results may be different for products with low involvement. Besides, it is recommended for future researchers to use the proposed model for products with low involvement. It is also possible to undertake a new empirical study with concurrent examination of a product with low involvement and a product with high involvement. It is also possible to undertake a new empirical study with concurrent examination of a product with low involvement and a product with high involvement. Andrew, L. (2005). Religiosity and the construction of a cultural-consumption identity. Journal of Consumer Marketing, 22(3), 142-151. Arndt, J. (1967). Role of Product-related Conversations in the Diffusion of a New Product. Journal of Marketing Research, 4, 291-295. Bandura, A. (1986). Social Foundations of Thought and Action: A Social Cognitive Theory. Englewood Cliffs, NJ. : Prentice-Hall. Bass, Frank M. (1969). A New Product Growth for Model Consumer Durables. Management Science, 15(5,January), 215-227. Bayus, Barry L. (1985). Word of mouth: The Indirect Effects of Marketing Efforts. Journal of Advertising Research, 25 (3), 31-39. Bearden, W. O., and Etzel, M. J. (1982). Reference group influence on product and brand purchase decisions. Journal of Consumer Research, 9, 183-194. Bonne, K., Vermeir, I., Bergeaud-Blackler, F., and Verbeke, W. (2007). Determinants of halal meat consumption in France. British Food Journal, 109(5), 367-386. Booz, A., and Hamilton, H. (1982). New Products Management for the 1980s. New York, NY. : Booz Allen Hamilton. Brown, T. J., Barry, T. E., Dacin, P. A., and Gunst, R. F. (2005). Spreading the word: investigating antecedents of consumers' positive word-of-mouth intentions and behaviors in a retailing context. Journal of the Academy of Marketing Science, 33(2), 123-138. Brunso, K., Scholderer, J., and Grunert, K. G. (2004). Closing the gap between values and behavior: a means-end theory of lifestyle. Journal of Business Research, 57, 665-670. Burgess, S. M. (1992). Personal values and consumer research: an historical perspective. In Sheth, J. N. (Ed. ), Research in Marketing (Vol 11, pp.35-79), Greenwich, CT: JAI Press. Chau, P. Y. K., and Hui, K. L. (1998). Identifying early adopters of new IT products: a case of Windows 95. Information and Management, 33(5), 225-230. Cova, B., and Cova, V. (2002). Tribal marketing: the tribalisation of society and its impact on the conduct of marketing. European Journal of Marketing, 36(5-6), 595-620. Cova, B., and Salle, R. (2008). The industrial/consumer marketing dichotomy revisited. Journal of Business & Industrial Marketing, 23(1), 3-11. Daghfous, N., Petrof, J. V., and Pons, F. (1999). Values and adoptions of innovations: a cross-cultural study. Journal of Consumer Marketing, 16, 314-331. Derbaix, C., and Vanhamme, J. (2003). Inducing word-of-mouth by eliciting surprise: a pilot investigation. Journal of Economic Psychology, 24(1), 99-116. Dickerson, M. D, and Gentry, J.W. (1983). Characteristics of adopters and non-adopters of home computers. The Journal of Consumer Research, 10(2), 225-235. Fam, K. S., Waller, D. S., and Erdogan, B. Z. (2002). The influence of religion on attitudes towards the advertising of controversial products. European Journal of Marketing, 38(5), 537-555. Feldman, Lawrence P., and Armstrong, Gary M. (1975). Identifying Buyers of a Major Automotive Innovation. Journal of Marketing, 39 (January), 47-53. Fitzgerald Bone, P. (1995). Word-of-mouth effects on short-term and long-term product judgments. Journal of Business Research. 32, 213-223. Folkes, V. S. (1988). The availability heuristic and perceived risk. Journal of Consumer Research, 15 (1), 13-23. Foxall, G. R. (1988). Consumer innovativeness: novelty seeking, creativity, and cognitive style. in Hirschman, E.C. and Sheth, J.N. (Eds), Research in Consumer Behavior (Vol. 3, 79-113), Greenwich, CT: JAI Press. Freiden, J. B., and Goldsmith, R. E. (1988). Correlates of consumer information search for professional services. Journal of Professional Services Marketing, 4(1), 15-29. Garber, T., Goldenberg, J., Libai, B., and Muller, E. (2004). From density to destiny: using spatial dimension of sales data for early prediction of new product success. Marketing Science, 23(3), 419-428. Garver, M. S., and Mentzer, J. T. (1999). Logistics research methods: Employing structural equation modeling to test for construct validity. Journal of Business Logistics. 20(1), 33-57. Gatignon, H., and Robertson, T. S. (1985). A propositional inventory for new diffusion research. Journal of Consumer Research, 11, 859-867. Gatignon, H., and Robertson, S. (1991). Innovative decision processes. in Robertson, T.S. and Kassarjian, H.H. (Eds), Handbook of Consumer Behavior (pp316-348), Englewood Cliffs, NJ : Prentice-Hall. Gronroos, C. (2006). On defining marketing: finding a new roadmap for marketing. Marketing Theory, 6(4), 395-417. Griffin, A. (1997). PDMA research on new product development practices: updating trends and benchmarking best practices. Journal of Product Innovation Management, 14, 429-458. Hae, Jin Gam (2010). Are fashion-conscious consumers more likely to adopt eco-friendly clothing? Journal of Fashion Marketing and Management, 15(2), 178-193. Harrison-Walker, L. J. (2001). The measurement of word-of-mouth communication and investigation of service quality and customer commitment as potential antecedents. Journal of Service Research, 4(1), 60-75. Hennig-Thurau, T., Gwinner, K., and Gremler, D. (2002). Understanding relationship marketing outcomes: an integration of relationship benefits and relationship quality. Journal of Service Research, 4(3), 230-247. Hirschman, E. C. (1980). Innovativeness, novelty seeking, and consumer creativity. Journal of Consumer Research, 7(3), 283-295. Hoelter, D. R. (1983). The analysis of covariance structures: Goodness-of-fit indices. Sociological Methods and Research, 11, 325–344. Holak, S. L., and Lehmann, D. R. (1990). Intention and the dimensions of innovation: an exploratory model. Journal of Product Innovation Management, 7, 59-73. Hurt, H.T., Joseph, K., and Cook, C.D. (1977). Scales for the measurement of innovativeness. Human Communication Research, 4(1), 58-65. Ilyas, S., & Hussain, M. F. (2011). An Integrative Framework for Consumer Behavior: Evidence from Pakistan. International Journal of Business and Management. 6(4), 120- 128. Im, S., Bayus, B. L., and Mason, C. H. (2003). An Empirical Study of Innate Consumer Innovativeness, Personal Characteristics, and New-Product Adoption Behavior. Journal of the Academy of Marketing Science. 31, 61-73. Jamal, A. (2003). Marketing in a multicultural world: the interplay of marketing, ethnicity and consumption. European Journal of Marketing, 37(11), 1599-1620. Jo¨ reskog, K. G., & So¨rbom, D. (2003). LISREL 8: User's Reference Guide. Chicago, IL: Scientific Software International. Kahle, L. R. (1983). Social Values and Social Change: Adaptation to Life in America. New York, NY. : Praeger. Kamakura, W. A., and Mazzon, J. A. (1991). Value segmentation: a model for the measurement of values and value systems. Journal of Consumer Research, 18(September), 208-218. Kozinets, R. V. (1999). E-tribalized marketing? The strategic implications of virtual communities of consumption. European Management Journal, 17(3), 252-264. Kumar, V., and Krishnan, T. V. (2002). Multinational diffusion models: an alternative framework. Marketing Science, 21(3), 318-331. Labay, D. G., and Kinnear, T. C. (1981). Exploring the consumer decision process in the adoption of solar energy systems. Journal of Consumer Research, 8(December), 271-278. Lai, A. W. (1991). Consumption situation and product knowledge in the adoption of a new product, European Journal of Marketing, 25(10), 55 – 67. Lattin, J. M. and McAlister, L. (1985). Using a varietyseeking model to identify substitute and complementary relationships among competing products. Journal of Marketing Research, 22(3), 330-339. Leavitt, C., and Walton, J. (1975). Development of a scale for innovativeness. Advances in Consumer Research, 2(1), 545-555. Leech, N. L., Barrett, C. K., & Morgan, G. A. (2005). SPSS for Intermediate Statistics; Use and Interpretation (2nd edn). Mahwah, New Jersey: Lawrence Erlbaum Associates. Lindridge, A. (2005). Religiosity and the construction of a cultural- consumption identity. Journal of Consumer Marketing, 22(3), 142-151. Locander, W. B., and Hermann, P. W. (1979), The effect of self-confidence and anxiety on information seeking in consumer risk reduction. Journal of Marketing Research, 16(2), 268-274. Manning, K. C., Bearden, W. O., and Madden, T. J. (1995). Consumer innovativeness and the adoption process. Journal of Consumer Psychology, 4(4), 329-345. Martilla, J. A. (1971). Word of mouth communication in the industrial adoption process. Journal of Marketing Research, 8(2), 173-178. Martinex, E., Polo, Y., and Favian, C. (1998). The acceptance and diffusion of new consumer durables: difference between first and last adopter. Journal of Consumer Marketing, 15(April), 323-342. Menon, S., and Kahn, B. E. (1995). The impact of context on variety seeking in product choices. Journal of Consumer Research, 22(3), 285-295. Merton, R. K. (1968). Social Theory and Social Structure. New York, NY : The Free Press. Midgley, D. F., and Dowling, G. R. (1978). Innovativeness: the concept and its measurement. Journal of Consumer Research. 4(4), 229-242. Midgley, D. F. and Dowling, G. R. (1993). A longitudinal study of product form innovation: the interaction between predispositions and social messages. Journal of Consumer Research, 19(4), 611–625. Moore, G. A., & McKenna, R. (1999a). Crossing the Chasm: Marketing and Selling High-Tech Products to Mainstream Customers (ed). New York, NY. : Harper Business. Moore, G. A. (1999b). Inside the Tornado: Marketing Strategies from Silicon Valley's Cutting Edge. New York, NY: Harper Business. Mowen, J. C., Christia, J. and Spears, N. (1998). Consumer innovativeness: a general consumer trait or a product category specific trait. In Goodstein, R.C. and Mackenzie, S.B. (Eds). AMA Educators' Proceedings: Enhancing Knowledge Development in Marketing, American Marketing Association, Chicago, IL, p. 144. Mudd, S. (1990). The place of innovativeness in models of the adoption process: an integrative review. Technovation, 10(2), 119-134. Ostlund, L. E. (1972). A study of innovativeness overlap. Journal of Marketing Research, 9(3), 12-20. Ostlund, L. E. (1974). Perceived innovation attributes as predictors of innovativeness. Journal of Consumer Research, 1(September), 23-29. Peterson, R. A. (1989). Some limits on the potency of word-of-mouth information. Advances in Consumer Research, 16. 23-29. Porter, Thomas C. Robert A. Swerdlow, and William A. Staples (1979). Who Uses Bank Debit Cards. Business Horizons, 22(February), 75-83. Raju, P. S. (1980). Optimum stimulation level: its relationship to personality, demographics, and exploratory behavior. Journal of Consumer Research, 7(3), 272-282. Ram, S. and Sheth, J. N. (1989). Consumer resistance to innovations: the marketing problem and its solutions. Journal of Consumer Research, 6(2), 5-14. Rehman, A., & Shabbir, M.S. (2010). The relationship between religiosity and new product adoption. Journal of Islamic Marketing. 1(1), 63-69. Rogers, E. M. (1962). Diffusion of innovation. New-York: The Free Press. Rogers, E. M. and Shoemaker, F. F. (1971). Communication of Innovations. The Free Press, New York, NY. Rogers, E. M. (1995). Diffusion of Innovations. New York, NY. : The Free Press. Rogers, E. M. (2003). Diffusion of Innovations. New York, NY: The Free Press. Rokeach, M. J. (1973). The Nature of Human Values. New York, NY:The Free Press. Roselius, T. (1971). Consumer rankings of risk reduction methods. Journal of Marketing, 35(January), 56-61. Rourke, D. L. a. M. (1999). From Invention to Innovation. US Department of Energy. Washington, DC: Brookings Institution Press. Ryan, B., and Gross, N. (1943). The diffusion of hybrid seed corn in two Iowa communities. Rural Sociology, 8(1), 15-24. Schwartz, S. H. (1992). Universals in the content and structure of values: theoretical advances and empirical tests in 20 countries. in Zanna, M. (Ed. ), Advances in Experimental Social Psychology (pp.1-65), Orlando, FL: Academic Press. Schwartz, S. H., and Sagiv, L. (1995). Identifying culture-specifics in the content and structure of values. Journal of Cross-Cultural Psychology. 26(January), 92-116. Settle, R. B., and Alreck, P. L. (1989). Reducing buyers' sense of risk. Marketing communications, 14(1), 34-40. Sheth, J. N., Newman, B. I., and Gross, B. L. (1991). Consumption Values and Market Choices: Theory and Applications, Cincinnati, Ohio: South-Western Publishing Co.
Sivadas, E., and Dwyer, F. R. (2000). An examination of organizational factors influencing new product success in internal and alliance-based processes. Journal of Marketing, 64(1), 31-49. Sivo, S. A., Fan, X. T., Witta, E . L., and Willse, J. T. (2006). The Search for 'Optimal'Cutoff Properties: Fit Index Criteria in Structural Equation Modeling. The Journal of Experimental Education, 74(3), 267-289. Stafford, J. E. (1966). Effect of group influences on consumer brand choice preference. Journal of Marketing Research, 3, 68-75. Summers, J. O. (1971). Generalized change agents and innovativeness. Journal of Marketing Research. 8(August), 313-316. Thompson, C. J., Rindfleisch, A., and Arsel, Z. (2006). Emotional branding and the strategic value of the doppelganger brand image. Journal of Marketing, 70(1), 50-64. Wang, Guangping., & Wenyu Dou, Nan Zhou (2006). Consumption attitudes and adoption of new consumer products: a contingency approach. European Journal of Marketing. 42(1/2), 238-254. Woodside, A. G., and Delozier, M. W. (1976). Effect of word of mouth advertising on consumer risk taking. Journal of Advertising, 5(4), 12-19. Yeung Ruth M. W., & Yee Wallace M. S. (2003). Risk Reduction: An Insight from the UK Poultry Industry. Nutrition & Food Science. 33(5), 219-229.